WHAT DO I DO IF MY PIPES FREEZE? If you live in an area with extreme winter temperatures, you run the risk of the pipes in your home freezing. As water running through your pipes begins to freeze, the water will expand 10% in volume until the pressure rises enough to split your pipes open, potentially causing severe water damage to your home. There are a few things you can do to keep your pipes from freezing in the first place, and – if you act quickly – there are even ways to thaw frozen pipes in your house before they burst. 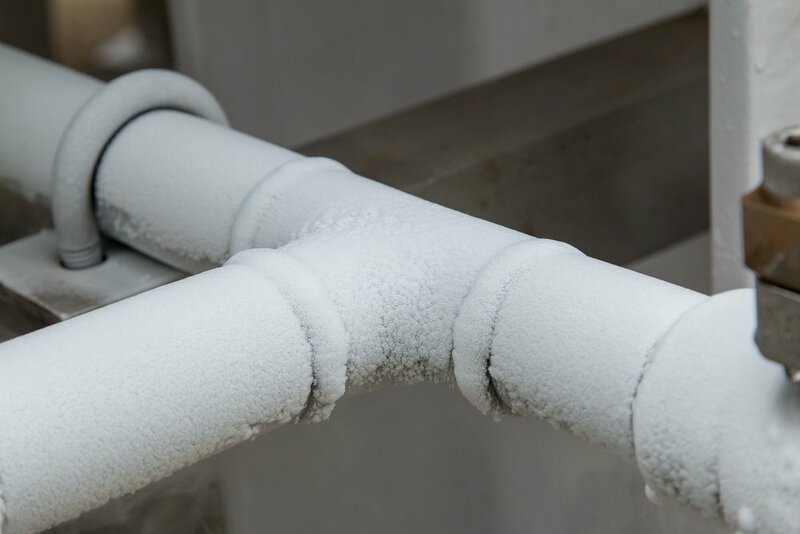 Read these tips from ServiceMaster Restore® to learn what to do if your pipes freeze up. · Install a heating cable. For the coldest climates, consider installing electrical heating cables around crawlspace pipes to be sure that no water is able to freeze. · Add extra insulation. Adding insulation to water pipes in unheated areas throughout your home, including the garage, basement and any outdoor taps, can make water less likely to freeze. · Repair leaks. If your pipes have any cracks or leaks, make repairs before cold temperatures arrive. Otherwise, leaking water may freeze right at the cracks, expand, burst and leave you with significant (and expensive) damages. o If your washing machine sits in an unheated garage, turn off water supply lines and disconnect the hoses, especially if you know that temperatures that day are expected to drop below freezing. o If you know you're going to be away from home for a few days or more, consider completely turning off your main water valve to avoid plumbing system damages. o Be sure to disconnect outside water hoses before cold weather hits so any sitting water in the hoses can't freeze, expand and destroy the hose or connecting pipes inside. · Open cabinet doors. Opening cabinet doors underneath sinks in kitchens and bathrooms allows heat to circulate around the uninsulated pipes, especially if the cabinets are near exterior walls. · Keep it moving. Gently turning on taps connected to pipes that are likely to freeze keeps the water moving and reduces the risk of freezing. Remember to let only a small amount of water flow through, and keep the cabinets around pipes open so warm air can circulate and increase water flow, as well. How do I thaw frozen pipes in my house? If you've already identified frozen pipes in your home, there are a few ways you can thaw them out before they cause a bigger problem. · Turn off your water. Turning off your water supply will reduce pressure on the frozen pipes and minimize flooding if the pipe does end up bursting. Once your water is shut off, try the techniques below to thaw your pipes or call for professional help. · Warm it. Use a hairdryer to thaw the entire area so the water gently melts, reducing the risk of damage. You can also try using a heat lamp to warm the area. · Wrap it. Wrap and secure a heavy towel around the pipe to concentrate heat to one area. Then, place a bucket underneath the pipes and pour hot or boiling water over the towel. · Use a hose. If you have access to the pipe and it's large enough, you can try running a garden hose through it. When you can't push the hose through anymore, you've reached the frozen area. Try raising your end of the hose and running hot water through it until the ice is able to melt. Be careful during this process since overfilling could cause hot water to come back up on your end before the blockage has fully melted. · Look for any leaks in your exposed pipes, as well as damp patches on your walls, ceilings, and floors. Once the pipes have thawed, there can still be a high amount of pressure that can put you at risk for leaks or bursts. Some pipes may need to be completely replaced in order to avoid future failure. In the event that the worst does happen, call the experts to help clean up any water damage caused by burst pipes or flooding. The trained, caring and professional water damage technicians at ServiceMaster Restore® are here 24/7/365 to help you through the entire restoration process so you can get your home and your life back to normal as quickly as possible.